Knowing your phase of business growth is important to understand the tasks, challenges, and changes that lie ahead.What phase of business growth are you in? Are you sprouting, a seedling, budding, flowering, or ripening? 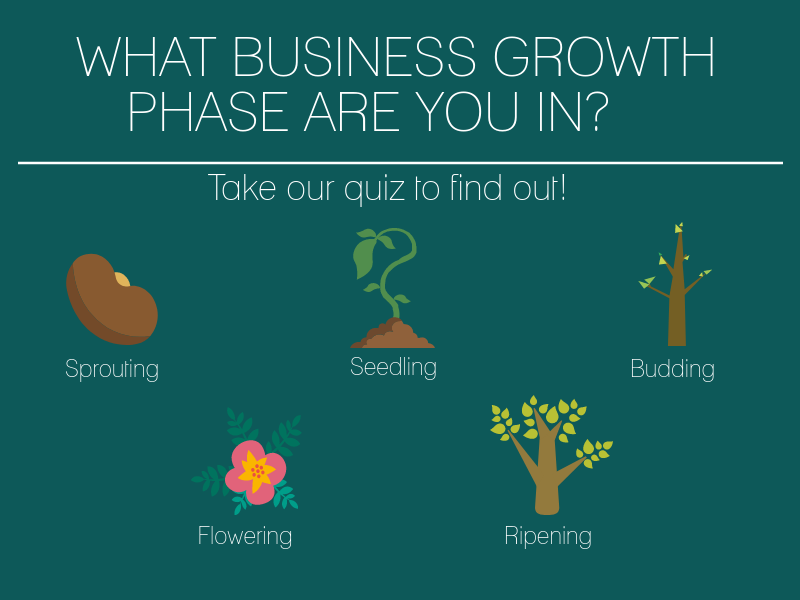 Take our quiz to find out now, and attend our Business Growth Hot Seat to nuture your way to growth! Click here for Business Growth Hot Seat event details! What is the biggest challenge right now for you and your company? What best reflects your current business structure? There are multiple departments and management teams working across geographies. We have a small team working from one location. What best describes your staff roles? It's me and support staff who wear many hats. How would you describe staff training within your company? There is ongoing and enterprise-wide training. How does internal reporting function within your company? What is your business risk strategy? What are your top goals for the next 12 months? Looking at the past three years, how quickly would you say your company responded to global market changes? Hire our A-team, the best and brightest talent we can find. Gain funding and profits, and put our business out there! Manage the internal structure of the company to ensure our operations run smoothly. Our company, product or service fills a defined gap in the market place. We examine market changes, but have limited capacity to react. We put reaction strategies in motion, but have limited capacity to react rapidly. We react as quickly as we can, but historically it takes a few years. How much annual revenue does your company generate? What business growth phase are you in? 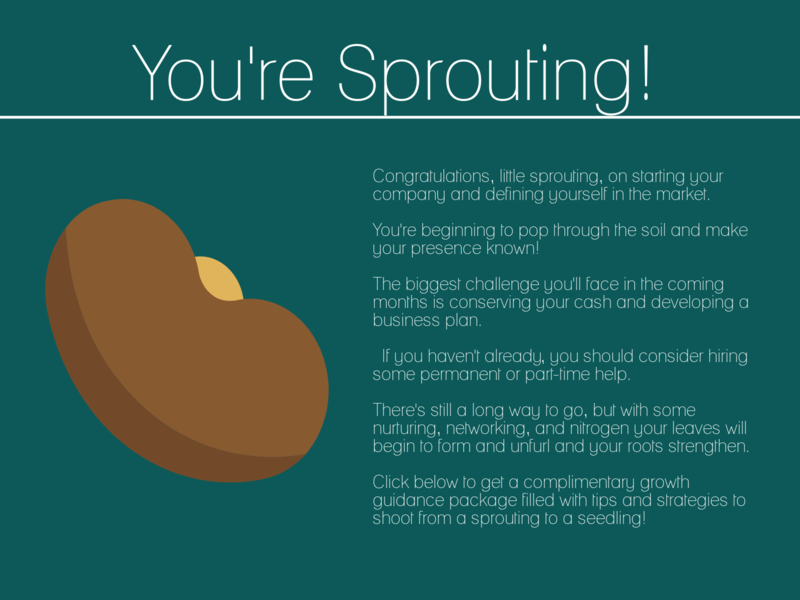 SPROUTING: Keep pushing through the soil, your business is sprouting! Grow your business to the next level by taking a seat in the Business Growth Hot Seat! Learn to grow your business from one stage to the next with tailored information based on your results. 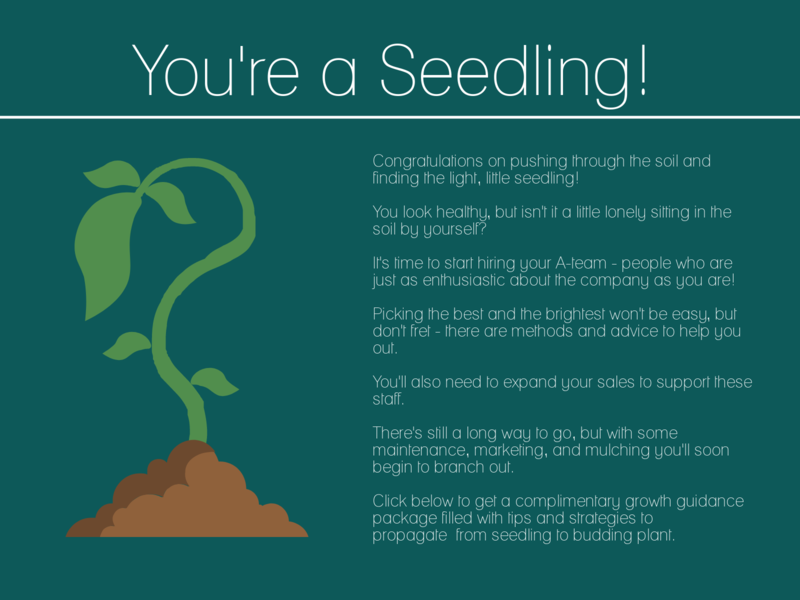 SEEDLING: Spring up, your business is a seedling! 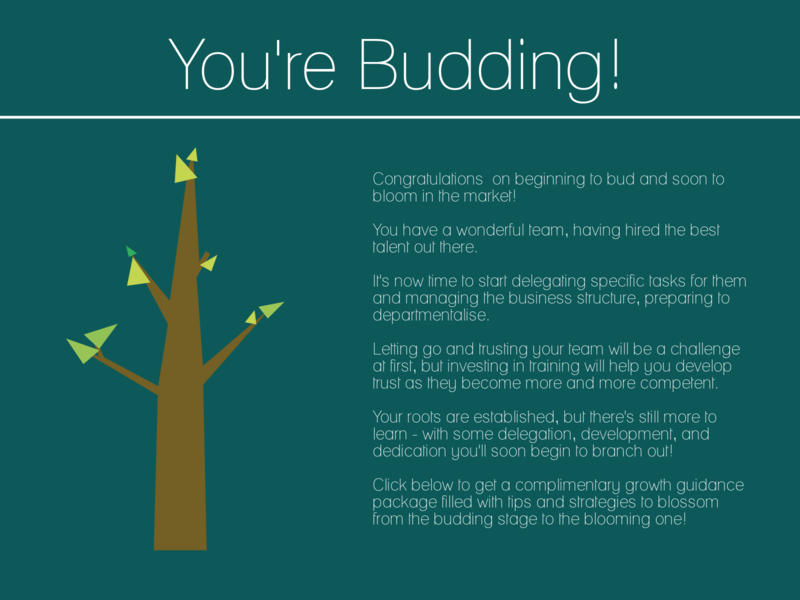 BUDDING: Bloom and blossom, your business is budding! 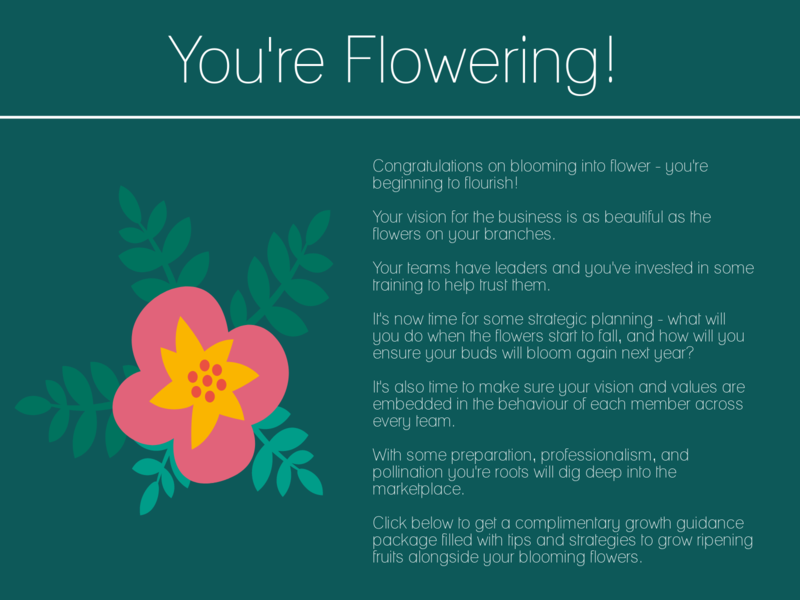 BLOOMING: Aromatic and unfurling, your business is blooming! 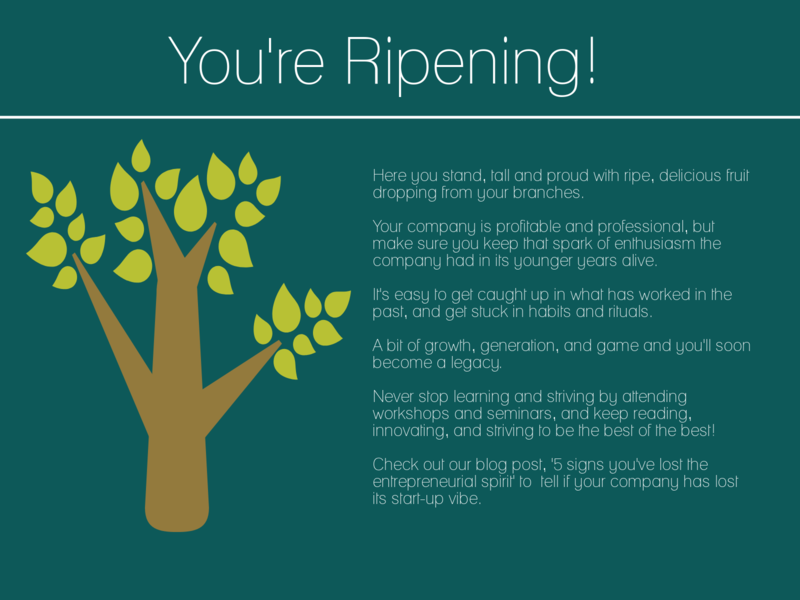 RIPENING: Delicious, fresh, and ready to eat, your business is ripening!